Whether you’re a computer technician, web designer or even a casual computer user, chances are you don’t want your personal data to be shared with the whole world or deleted without your permission. 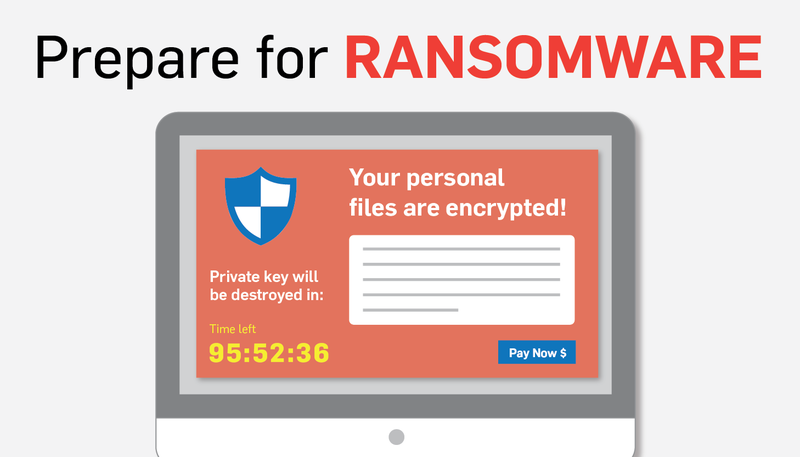 Ransomware is designed to trick users into downloading unwelcome viruses. The download pretends to be an important email, internet download, or a PDF file. When the user clicks on this fake link the ransomware buries itself in the computer and starts encrypting the users data.The user’s data becomes encrypted (almost impossible to access) and a message pops up with the next steps. When you receive this message, stop what you are doing. Let go of the mouse and assess the situation. Hackers are known to design fake anti-virus messages that lock users out of their computers. The message reads “your computer is infected please call now for expert assistance with removal”. Unknowingly, we have had customers in the past call the phone number on the message. We’re hear to inform you that you should never call the phone number, no matter what. This is a common tactic used by malicious individuals. An educated user is a smart user. The more aware you become of different type of ransomware, the better you can act when a ransomware issue appears in the wild. From a business perspective, ransomware can cause disruption to day to day operations, financial loss and harm to your organization’s reputation. Let’s provide an example of how you can prevent ransomware from affecting your business. An employee is browsing the internet and comes across a compelling advertisement. The advertisement promises faster PC by downloading a special software. The employee clicks on the ad. In addition, the employee has administrative rights. These rights allow the employee to download software at their discretion. The employee downloaded an unexpected virus on the PC. Turns out the ad was fake. The employee is unable to work and the computer has been compromised. For a business with no Managed Service Provider monitoring such activity, the computer can be inoperable for hours or even days. What can a business do? For example, the business can perform a search online and find the nearest computer repair shop. Another option is to determine if the computer can download a malware scanner and run the scanner. However, downloading any software may be unavailable. The Managed Services Provider (Zuma Technology) receives a notification a computer is infected. We would contact the customer to inform them about the ransomware. We’d activate the already installed anti-virus to scan the PC. After the malware scanner is complete, we would clear the PC of all viruses and digitally hand the computer back to the employee. The employee is free to be productive. As a result of the employee possessing administrative rights, the malware issue can be avoided with best IT practices. For instance, we inform all customers the best practice is a proactive approach. We do not grant administrative access to all employees in the company. First of all, users with admin rights invites opportunities for ransomware software to be downloaded. Second, users have the capability to modify anything on the computer. A computer user who is not savvy can harm the system in numerous ways. Lastly, the admin user can install unproductive software, such as iTunes, Spotify, or Pandora. These are a few reasons why not all employees should have administrative rights. Keep on top of updates for your antivirus and other applications. Don’t say no to familiar updates and be wary of popups. Especially if the pop up ask for you to update your account information or install applications you did not specifically request. If an offer sounds too good to be true, chances are it is. Stick with trusted sites and don’t fall victim to scams like “You’re Winner!” or free Amazon gift cards. Be aware of email attachments: ransomware commonly comes in the form of bogus online orders. Ensure your critical files are being backed up often, preferably offsite, in case you do get infected. Files saved to an attached USB drive or another location on your network are still vulnerable! Bookmark your favorite websites. Hackers often create pages with names very close to commonly used sites (Gogle.com). Save your most-used websites to avoid typing the wrong address and ending up somewhere you don’t want to be. For example, most websites have a padlock located in the address bar. This indicator provides peace of mind knowing the website is secure. #3 – Don’t Feed The Hackers! If you think you’ve been infected, first thing to do is not panic. Download a known malware anti-virus and install the software immediately. If you get a warning from your antivirus about a possible threat, don’t dismiss it. Report it to your support team, with lots of details! For instance, when running a malware scanner, pay attention to what the software finds. As a result, you may be able to identity where the virus came from. Therefore, helping both yourself and the IT Support staff. In short, being an educated user is a practice we take seriously. For instance, we like to educate customers on the risk of assigning all users administrative rights. Also, we provide best IT practices for performing day-to-day activities for all level of users.